The way the hot tub wedding cake evolved was an interesting process. Miwa and Darnell originally wanted a traditional wedding cake with a tropical design. 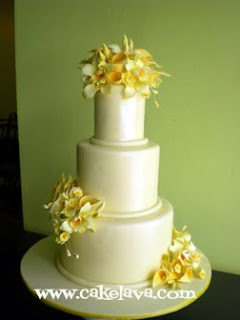 They requested to have the cake be mostly white with some plumeria flowers. We came up with some ideas and after discussions about the design, they decided to change directions and go instead with a sculpted cake. We were asked if Rick could make a sculpted bathtub with them in it and some items like a champage bottle, strawberries and chocolate, and to integrate a tropical element that would look like they were bathing outdoors. The bathtub idea evolved into a hot tub, and from there, all the pieces fell into place. They loved the idea, sent us photos of themselves for the custom bride and groom figures and in the months to follow we all got excited about the "hot tub wedding cake". I remember Rick asking several times, "Hey, when is that hot tub wedding cake?" and at some point it was referred to as the "Hot Tub Time Machine", because of the movie with the same title. Miwa and Darnell's wedding reception took place last Friday night at the Presidential Suite of a Waikiki Hotel. 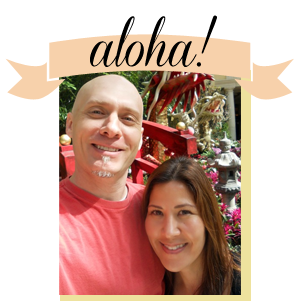 They had a big lanai in their suite with the most incredible view overlooking Waikiki. We placed the hot tub wedding cake on a table next to where the couple would later be seated. 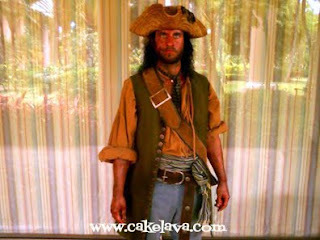 On Monday we recieved a call from Darnell saying how much they loved their cake and it was a huge hit with the guests. It was a hit with us as well! 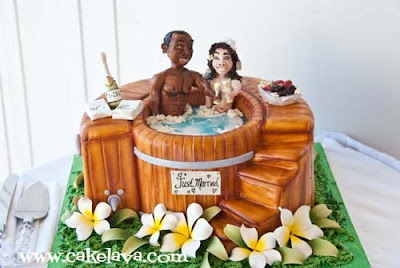 We will long remember Miwa and Darnell relaxing and clinking champagne glasses in their "Just Married" hot tub wedding cake! The Alice in Wonderland cake made for Jolie's birthday party was one of our favorite cakes this month. The client gave Rick full artistic control over the design. She wanted something funky and colorful and left all the details up to him. Rick made each tier with a different scene from Wonderland and added hand painted characters. Handcrafted whimsical flowers and colorful mushrooms, adorned the cake, and at the base and on top of the cake was a black and white checkerboard pattern. 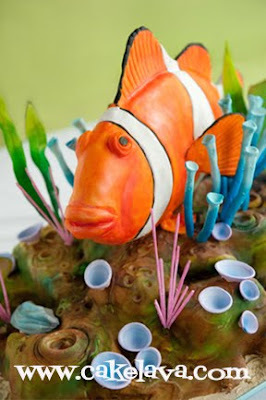 The cake was made for a child's first birthday luau, which is customary in Hawaii. In Polynesian culture, reaching a baby's first year is considered a huge milestone, and a cause for celebration. A giant checkerboard "1" was placed on top in Jolie's honor. 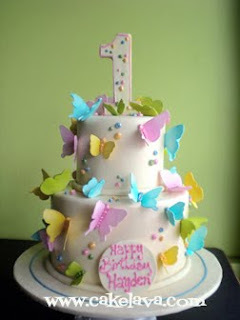 The beautiful cake was a decadent display of color on the outside and a rich Peanut Butter Fudgey flavor on the inside. 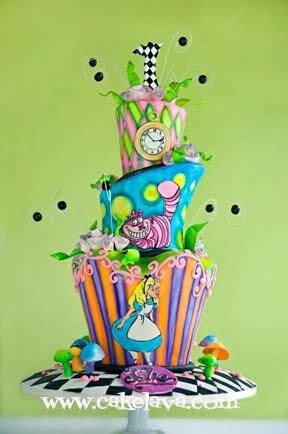 The Alice in Wonderland themed party took place at a hotel in Waikiki. Large custom made characters were placed in the room and each table had a whimsical centerpiece scene, thoughtfully created. In the center of the room was the tea party table, with cookies around it and in the middle we placed the cake. Our clients did a fabulous job carrying out the theme and the cake looked right at home. In Wonderland. 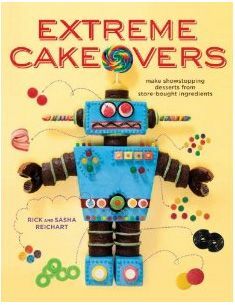 For the past several years we have received regular requests from fellow cake artists asking if Rick is teaching classes anywhere. We are absolutely thrilled to announce that Rick has decided to take the plunge in a big way and will be making his teaching debut in a 3-day class in Canada at Icing Inspirations, located in Kitchener, Ontario, outside of Toronto. 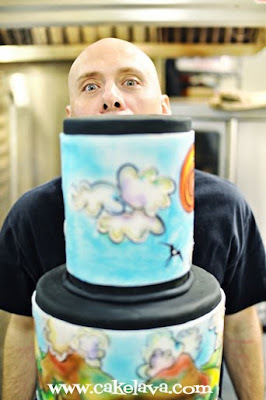 Rick received an invitation from Chrissie Boon, cake artist and owner of Too Nice to Slice and Icing Inspirations to fly out to Canada to teach a 3-day course and he was so honored and jumped at the chance! Mark your calendars for this special class "Discover your Inner Artist" with Rick Reichart. The dates are March 10th, 11th and 12th, 2011. The class is booked on a first come, first served basis and is limited to 15 students only. 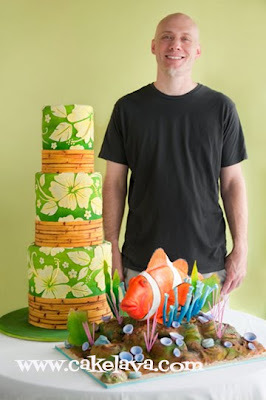 Rick has selected two of his original designs to teach in the classes, a hibiscus with bamboo wedding cake and a colorful sculpted clownfish underwater coral scene. Students will learn techniques that will help them discover their inner artist. Rick will demonstrate painting, airbrushing, sculpting and freehand art techniques without the use of molds, stencils or special cutters. At the end of the 3 day course, students will have two beautiful completed cakes. We can't wait to come to Canada! We hope to see you there in March 2011! 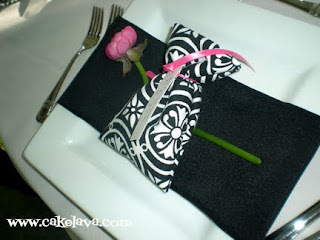 To learn more about the class and register, visit the Icing Inspirations class page. A Big Mahalo to photographer Rachel Robertson for her fabulous images! 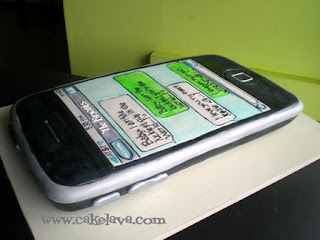 It was merely a coincidence that just days before the release of the new iPhone we would be making a wedding cake in the same theme. Our couple got married last weekend and had two cakes, an elegant fondant wedding cake with handcrafted flowers and an iPhone cake. 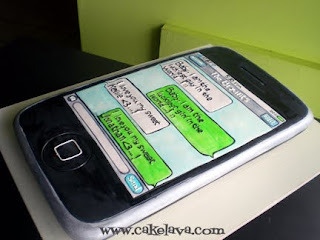 Technically, the iPhone cake was not a groom's cake, in fact it was ordered by the groom as a surprise for his fiancee, in other words, two brides cakes. This probably put the groom in a great position to have just about whatever he wanted on the honeymoon. 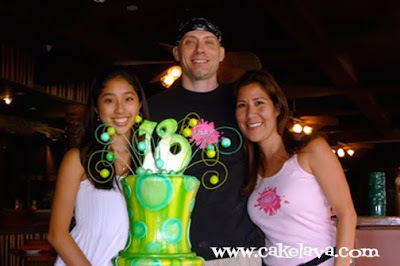 Last weekend we made a special cake for my cousin Maya's 18th birthday/high school graduation party at Tiki's Grill and Bar in Waikiki. Tiki's with its Hawaiian tiki theme, yummy food, and amazing views overlooking Waikiki Beach is the perfect spot to kick back with some friends and celebrate, and Maya had a lot to celebrate. For starters, acceptance to Stanford University, where she will be attending in the fall. This is my little cousin -- who would kill me for saying that because she's not so little anymore -- and Rick and I couldn't be more proud of her! She's grown up to be a beautiful super-smart young woman, and we wanted to make her a cake that would live in her memories as she enters the next exciting stage of her life. June is a tremendous month for Maya. In addition to a closing one chapter of her educational life and looking towards another one, she also turned 18 over the weekend. Maya has been a big fan of cakelava since we opened. 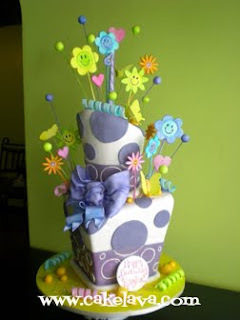 She loves Rick's bold fun designs and we knew funky was the direction we would go for her cake. 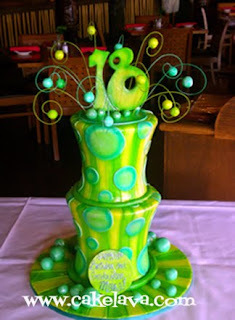 She asked for lime green and light turquoise to be used on the cake and gave me her invitation which had polka dots on it, should Rick wish to use it for inspiration. The design would be a surprise to Maya. When Rick was making Maya's cake, he was working on several other cakes at the same time and didn't see the invitation I had attached to the back of the order. 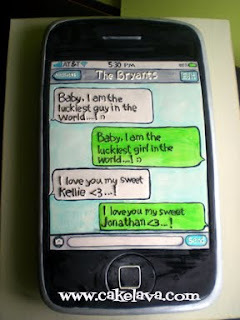 He was moving quickly from one cake to another and designed a cake he thought she would love. It wasn't until the cake was finished that he saw the invitation with the polka dots. What an amazing coincidence he selected polka dots for her cake! It's not the first time that his design matched the theme of the decor without knowing about it beforehand. People are often surprised when we show up with the cake "How did you know?" and the answer is "I didn't." It was just meant to be, I guess, just like Maya's cake, which by the way, she and her guests adored! Happy Birthday and Happy Graduation, Maya. We are so proud of you!! Thank you to Maya and her family for sending us the awesome photo! 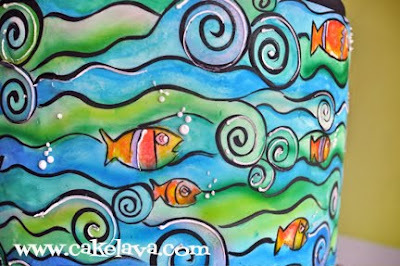 To see more funky colorful cakes, check out cakelava.com. Today's blog and cake is dedicated to my Aunt Anita Reyes, a cancer survivor. July is so close we can practically taste it! With a full calendar and an intense holiday weekend approaching, July is sure to a be memorable month. It will also be a special month as it's the first month in the American Cancer Society "Cakes for a Cure" 18 Month calendar. We posted about the calendar back in April when it was released. 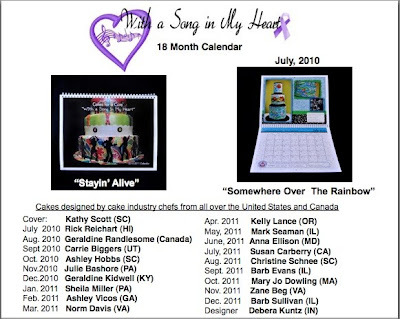 If you haven't ordered one yet, this beautiful calendar is filled with cakes by well-known cake artists in both the United States and Canada and $7.50 of the $20.00 price will be donated to the American Cancer Society. 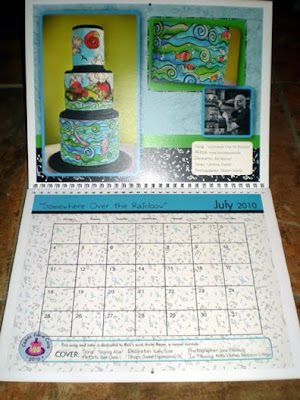 A list of the names of the cake artists invited to design for the calendar can be found at the bottom of this page. We were honored to be included in the list! You can visit the American Cancer Society Relay for Life, Greenwood, South Carolina chapter and click on "Cake Challenge Fundraiser" to place an order. We ordered a handful of them for our family members and ourselves and have one proudly displayed in our studio. In a little over a week we will be flipping open the calendar for July 2010, which also happens to be Rick's month! 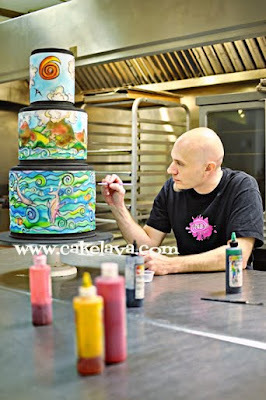 Shortly after we returned from Rick's Food Network Challenge competition, he started designing the cake for the calendar. As with every cake designer featured in the calendar, he was asked to design a cake around the theme "With a Song in My Heart", and the song he selected was a gorgeous little number by Hawaii's own Israel Kamakawiwo'ole who sings a hauntingly beautiful version of "Somewhere Over the Rainbow". The song is essentially about Hawaii's natural beauty. 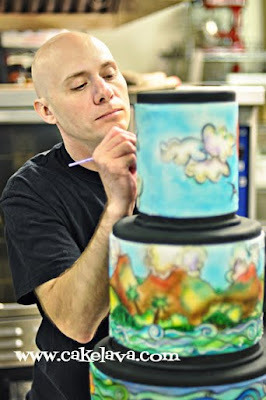 Rick chose to cover his cake with handpainted stylized scenes of land, sea and sky. Photographer Stephen Ludwig came to our studio to shoot Rick working on his cake and a selection of images was sent to the organizers of the "Cakes for a Cure" fundraiser. We chose to dedicate Rick's cake to Anita Reyes, who is my aunt and also a cancer survivor. She recently received a copy of the calendar and was very touched that we would design a cake in her honor. We'd like to encourage any cake enthusiast looking for a special gift to consider making a donation to the American Cancer Society by ordering a calendar or two or three. We are honored to have had the opportunity to donate our time and cake design for such a worthwhile cause. Special thanks to Patti Gagstetter at Relay for Life for organizing the event and Stephen Ludwig Photography for the stunning images. He did an amazing job! I can always tell when a cake is being made for a collector by the way the order is placed. 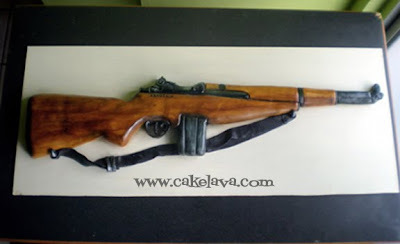 For the cake above, the client requested "I would like a cake in the shape of an M1 Garand". She didn't say "a cake in the shape of a gun" or "a cake in the shape of a rifle", it was the naming of a specific model that spoke volumes. She mentioned her husband was a rifle collector fanatic, which I had already suspected, and he was about to leave for deployment. Celebrations in honor of a loved one leaving for duty are happening with more frequency. It's always a little sad to hear their loved one is leaving and we want to make their goodbye celebration as special as possible. Rick did his homework for this cake. He wanted a rifle fanatic to recognize one of his favorite pieces, and made it look as realistic as possible. This cake was long, around three and a half feet and all cake. Rick added the family surname to the rifle as well. The rifle cake was delivered to a military base where security was tight at the gate, and we were surprised that no one noticed the large "gun" in the back of our vehicle as we drove through. When we arrived at the client's home, her husband hadn't yet arrived but the people who saw it loved it, and we knew then it would probably meet his standards as well. We want to thank our client and her husband for giving us the opportunity to be a part of their special day. We hope this is one of his favorite rifles in the collection! June has been one big amazing blur of cakes! One of those months where we're constantly looking at the calendar trying to remember what date it is. If the dates weren't defined by the cakes we have, we might never know what day it is! According to our June calendar and the client's order, the Batman cake above was made for a birthday party on Monday, just four days ago. It feels like much more time has passed than four days. 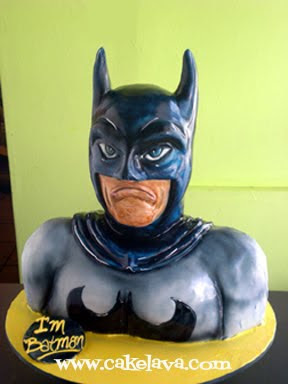 This sculpted Batman Dark Knight cake was made for a man celebrating his 21st birthday. His parents ordered the cake as a surprise for their son, who loves Batman, superheroes and comic books around the same time they ordered a Harry Potter themed cake for their daughter. Rick chose to model his Batman cake after the comic book rather than movie character, going more old school than the Hollywood movie version. Rick also happens to be a huge fan of Batman and comic books and was excited to make this cake for their son. As part of the birthday surprise, his parents brought the birthday boy into our studio to pick up his cake. He knew he was getting a cake but probably in his wildest dreams never thought he'd be picking up a Batman cake. He looked extremely happy and probably thought at that moment, his parents were the coolest people on earth! It was the perfect request, really. 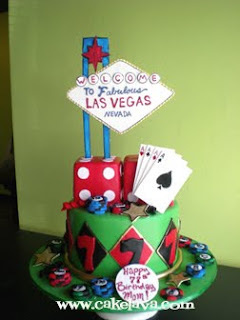 A Las Vegas themed cake for a 77th birthday party. The client fell in love with our Las Vegas cake with the sculpted dice on our website, and wanted her mother's cake to be made similarly, incorporating the number 7's wherever possible. Her cake hit the jackpot as lucky number 7's were placed all around the tier. Rick made her a great hand of cards, and gave her good amount of poker chips. Everything on the cake was made by hand and the dice were sculpted out of cake. We hope this cake helped celebrate the start of her luckiest year yet! The theme of today's blog is "pretty pastels." These cakes are a sweet symphony of soft pinks, purples, yellows and blues. As we prepare to officially welcome Summer next week, we're enjoying the fond memories of Spring celebrations. As you may be aware, Pirates of the Caribbean: On Stranger Tides, the 4th installment of the Disney movie series is scheduled to film this summer on Oahu. With the series finale of LOST and the recent filming of George Clooney's upcoming "Descendents" both on Oahu, the Hawaii film industry has been very busy and now turns it focus to Pirates 4 and the upcoming "Hawaii Five-0" series. 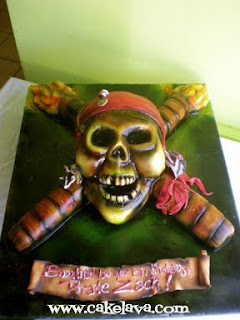 While we've yet to have a Johnny Depp or the Black Pearl sighting here, we did have the opportunity over the weekend (last night, actually) to make a birthday cake for a man named Zach who has been cast as one of the Pirates in the upcoming film. 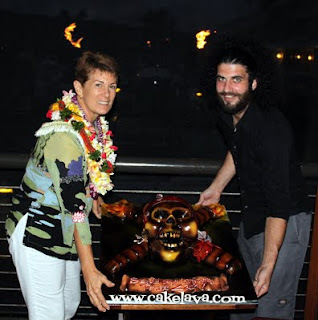 Our client Judy ordered a birthday cake for both herself and her friend Zach (shown below) for a party last night at the Kona Brewing Company. 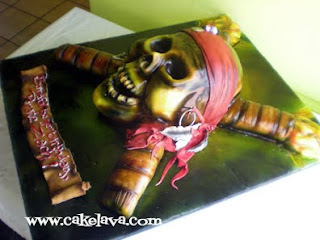 Hawaiian Slack Key Guitar master Ledward Kaapana performed at the party and Rick made a huge sculpted cake of the Pirates of the Caribbean skull and crossbones. We've included both sides of the cake below to fully show the level of detail. Judy selected our Coconut Pineapple Chunk flavor to serve their guests, and according to Judy's post today on our Facebook page it was a huge hit! Happy Birthday to Judy and Zach and thank you for making us part of your birthday celebration! 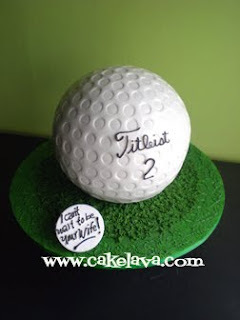 This golf ball groom's cake was made last week for a couple who flew in from the East Coast to get married. The bride requested "I can't wait to be your wife!" to be written on the cake and was very excited when she and her family came to pick up the cake. We hope our couple was able to take advantage of some of Hawaii's spectacular golf courses during their stay here! Every now and then we have the opportunity to make a cake for someone celebrating a truly significant birthday. All birthdays are significant of course, but when you reach the elite 90 years old and above club as our client's mother has, they deserve to have whatever cake they want. Our client called us with a very specific request for her mother's 90th birthday. 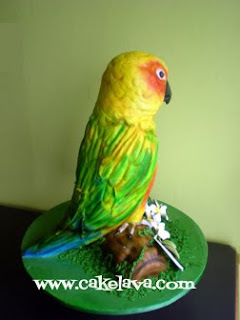 She wanted a sculpted Sun Conure bird that looked exactly like her pet "Chiqui". 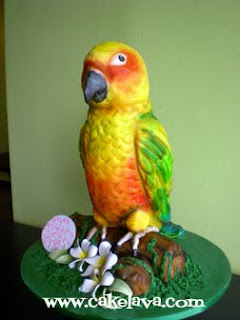 After deliberating whether to go with a cake in the shape of her African Grey Parrot or the Sun Conure, she opted for the more colorful choice and Rick had another nice little challenge ahead of him. 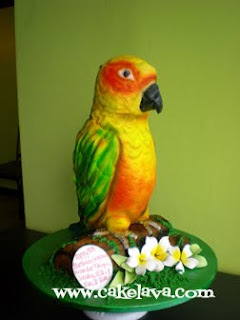 After years of making people's pets out of cake, we know how important it is to get every possible detail right because it isn't just a bird cake, this is somebody's beloved pet, another member of their family, with distinctive markings and expressions, all of which must be conveyed in cake. Our client brought a photo album to our studio to share with us pictures of "Chiqui", selecting certain poses that she thought looked "more like Chiqui" than others. Having never met Chiqui, Rick had the task of taking photos of the bird and transforming it into a 3-dimensional cake sculpture and capturing the many nuances of this particular bird. As you can see, the Sun Conure is FULL of color and when I came to visit the bird as a work in progress, our kitchen resembled a gorgeous, psychedelic color explosion in Rick's working area. When the cake was completed I had to hold my hand back on many occasions and resist the urge to pet it. We both thought the cake was super cute but what was even cuter was seeing the expression of a 90-year old woman adoring her cake. She recognized her bird immediately as did many of the guests. Our client said it looked exactly like "Chiqui" and couldn't be happier. We left feeling good and maybe a little sad we had to leave this cute birdie behind. Happy 90th Birthday to "Granny"! 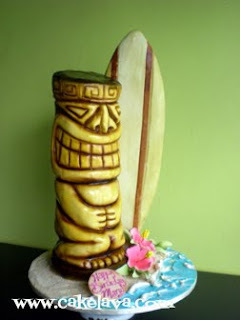 This sculpted Hawaiian tiki with a surfboard cake was a special one to us. It was ordered by a man for his wife in honor of her birthday, a day they would be unable to celebrate together because she was going on deployment. Rick chose to make this cake using both light and brown colors for the tiki and surfboard and added a couple hibiscus flowers and a beach at the base. 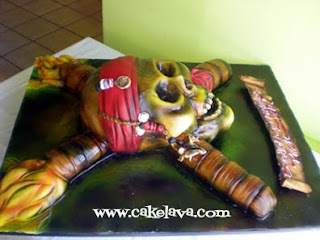 Our client and the party guests loved his wife's tiki cake and it looked incredibly realistic. Unfortunately we didn't have a chance to meet his wife but we want to wish her the best while she is away and are looking forward to making her and her husband another cake after she returns. It's been almost a year since we first met with our bride Porsche to design her and her fiance Micah's wedding cake. We knew from the beginning that she wanted a cake with a high WOW factor and a good dose of bling. In the months to follow, as Porsche and her team of vendors began pulling together the various design elements of the wedding, it became more evident what the cake would look like. The cake would be a pretty pink color with silver accents, unusual shapes of the tiers with the top tier perched on a pole with crystals or some type of bling dangling. 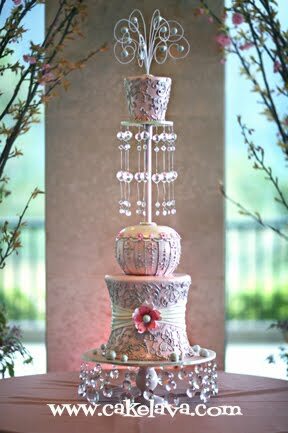 When we found out that cherry blossoms figured promiently in the florals and decor, and saw Porsche's exquisite couture wedding gown with its delicate beading, the cake design really came together! As soon as I saw Rick's sketch, I fell madly in love with Porsche and Micah's cake and thankfully so did they. For a cake with as dramatic a style as Porsche and Micah's, we opted to have the cake on a stand with more bling hanging from it. Their wedding cake on the outside was romantic and delicate but on the inside they went with rich, bold flavors, and chose our Peanut Butter Fudgey and Banana Nutella. Their wedding cake was definitely one of the va-va-voom variety, and it wasn't the only cake. Little did Micah know that Porsche had booked us for a fabulous groom's cake that would draw as much attention as her cake -- the standing Incredible Hulk cake! We couldn't have made two more different cakes side by side, and yet, so perfectly balanced. Congratulations, Porsche and Micah! 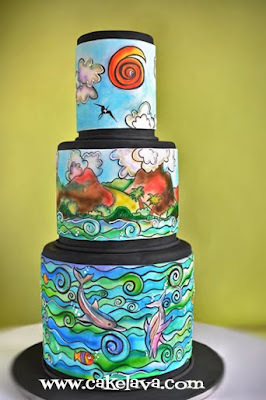 A big mahalo to photographer Frank Amodo for his amazing image of the cake! 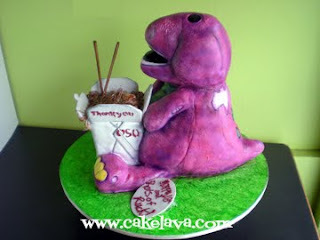 I feel like I'm saying the statement "one of our more unusual requests" with more frequency lately, but in the area of unusual requests, this adorable distressed Barney doll and chinese noodles cake, may just take the cake. At least for now. It is always easier to make a pristine version of something then a worn, frayed, distressed looking version of it. The curves have to be in just the right places, the textures worn down in a realistic fashion and it has to look like its weathered the years in a natural way. Maybe the body of the object has become separated from it's head and it leans just so. Even the colors aren't uniform anymore, with some areas having more saturation than others. This was our latest challenge. To recreate an 18 year old stuffed Barney doll that had been well-loved over the years, becoming almost like a member of the family. He wasn't as pretty as the newer, modern versions of Barney, but he was very special to a boy who had grown up with him his whole life. 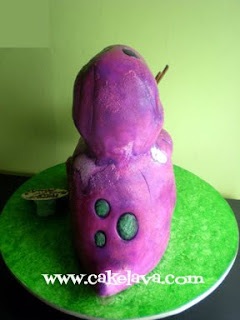 When I first spoke to our client Michelle, she asked if Rick could sculpt a Barney for her son's 18th birthday and high school graduation party. No problem. Could he be straddling something? Yes. Could that something be a box of Chinese Noodles? Uh, did you say noodles? Yes, noodles. 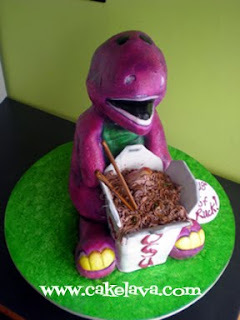 After digesting the idea of Barney as we know him to be would be sitting down with a box of Chinese noodles, we became excited about making it for Michelle's son. She explained to us that the Barney doll she wanted would need to look like her son's Barney doll he had since he was a baby. It would need to slouch in all the right places and maintain his loveable quality. Be warned that his head no longer stays perfectly upright and his body might be a tad lopsided, oh and he has numerous spots on him where the fabric has worn down from being touched and carried around. She brought the beloved stuffed doll to us and she wasn't kidding, this doll has been through some LIFE! Rick noticed that her Barney didn't have any pupils and asked if she wanted him to add them in. She declined the offer and wanted to go for as authentic a feel to the doll in its current state as possible. 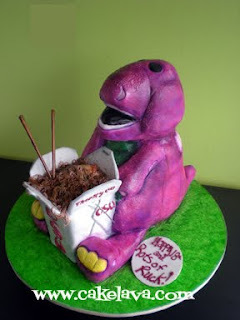 The "Barney with Noodles" cake as it came to be known, was delivered to Little Village Noodle House in Chinatown, hence, the Chinese noodle box. We found out that her son would be attending Oregon State University, and Rick put "OSU" on the front of the noodles box. For the writing, Michelle requested "Happy 18th Birthday and Rots of Ruck! ", which she thought would be cute. It was very cute! The cake was completely edible and full of delicious pink Guava Lava. The cake as you can imagine got a lot of attention when we brought it in. Diners in the restaurant seemed to recognize Barney, but maybe he looked a little different than Barney as they remembered him. This Barney looked like he had gone through some rough times in his life, perhaps. He had been somebody's favorite toy and treasured for many years. He had matured and looked a lot older. He was somebody's sentimental attachment and as a mother, she could definitely relate. 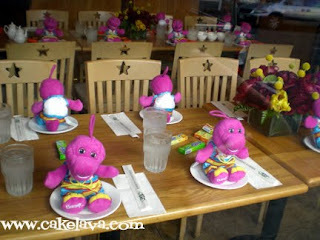 Barney was a theme carried throughout the party, with stuffed Barney dolls placed in front of each guest to take home. They were cute, but there's nothing like going old school, and we'll take the worn down, holey Barney version anyday! side view showing the full effect of the years of slouching. His stuffing had shifted in his face and upper body, pushing a little on his stomach. backside showing discoloration of his fur and areas. Not a perfectly rounded backside. brand new Barney dolls, of a newer generation, ready to party! We were excited the first time we met with Kassy and Ken to discuss their wedding cake. 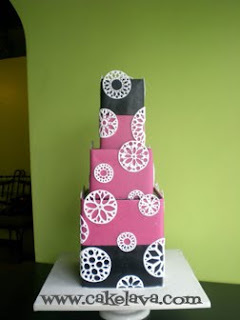 As soon as Kassy showed us their black and white spiral geometric fabric being used in the wedding we knew this would be a really fun cake for Rick to design. Rather than mimic exactly the pattern on the fabric, Rick chose dramatic square shaped tiers and round geometric patterns, similar to those you might find on a Spirograph. We grew up with the Spirograph toy, first introduced to America in the late 1960's. With the spirograph you could create beautiful, intricate geometric designs on paper, and we wanted to have a similar look on their wedding cake that would compliment the dark pink, black and white decor they would be using at their outdoor wedding. We knew it would be a labor intensive cake to make with all the intricate patterns but Kassy and Ken were worth it. Kassy told us that other than the actual marriage, she was most excited about the cake! Their wedding took place on the grounds of the Loulu Palms Estate on the North Shore. It was the same location (sans rain) as Nakita and Matthew's wedding, which was featured on Friday's blog. 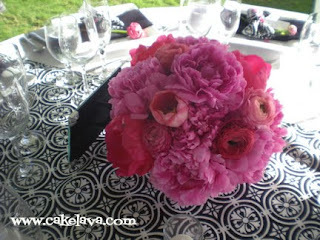 The weather was beautiful and the decor was striking with the beautiful pink peonies and other garden flowers contrasting with the bold black and white prints. This lovely oceanfront wedding was coordinated by Heather Hall of Heather Hall Events and everything looked perfect! Even the inside of the couple's cake was filled with some pink color. 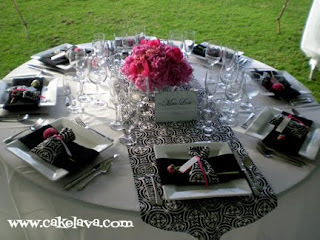 They chose our Guava Lava flavored cake as well as Rainbowlicious to serve their guests. Congratulations to Kassy and Ken!